From the same designer who brought us I♥NY; would this graphic design symbol get people more properly concerned? 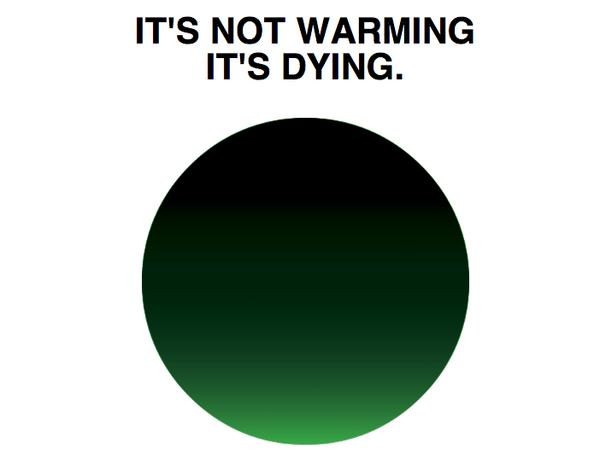 Designer Milton Glaser suggests a logo for discussions on global warming . . . Designer Milton Glaser created this logo; he’s serious, according to Salon, today. The obvious problem, right off the bat, is that Earth is warming: It’s done so rapidly over the 20th century, and is expected to continue at an even faster rate over the next 100 years. The world’s governments agreed that we should try to limit warming to below 2 degrees Celsius (3.6 degrees Fahrenheit) above pre-industrial levels to try to avoid the worst consequences of that warming, yet we’re on track to blow right past that limit. While Glaser obviously agrees that this is a problem, the slogan obscures that point. And as someone attuned to the world of climate deniers, I can’t help thinking that getting the hashtag #itsnotwarming to go viral might not have the intended effect. What do you think? A good idea? Better indicator of a more appropriate message?